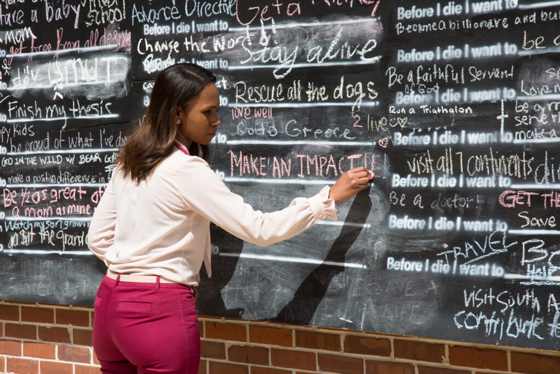 Before I Die walls, a way for community members to reflect on their mortality and consider their wishes, returned to Gainesville in early April. The walls were installed to promote National Health Care Decisions Day on April 16, a special day to empower the public and health care providers about the importance of advance care planning. The walls began when Candy Chang, a woman from New Orleans, grieved the death of a loved one. She painted “Before I die I want to _____,” on an abandoned house to encourage people in the community to confront mortality and begin a conversation about their end-of-life care wishes. In 2017, the walls made their way to Gainesville. “We wanted to bring it to UF Health, and multiple departments collaborated to do this in Gainesville to start advance care planning conversations,” said Alyssa Milonas, a Neuromedicine Interdisciplinary Clinical and Academic Program, or NICAP, intern. The NICAP interns installed 13 walls at locations across Gainesville. They include the 1329 Building, Facilities Administration Building, UF Health/HSC Sun Terrace, Arts in Medicine, HealthStreet, Reitz Union, Alachua County Senior Center, Haven, United Church of Gainesville, Possum Creek, Cone Park Library Branch and the 34th Street wall. 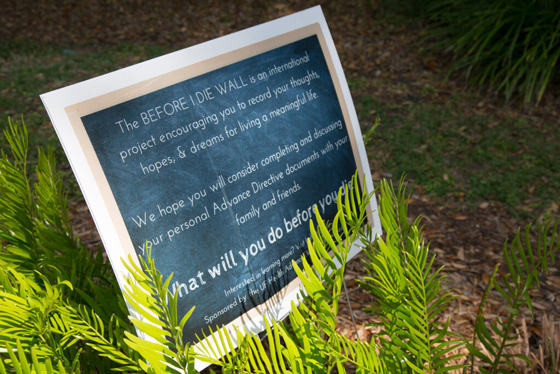 Jacqueline Baron-Lee, Ph.D., UF Health Shands director of quality improvement, said that each person who was part of the wall installation was able to write on it. “It’s one of those mediums where you can share something that’s as jovial as jumping out of an airplane or as heartwarming as a mother wanting to make an impact in her daughter’s life,” she said. Baron-Lee is thankful for student leaders Alyssa Milonas, Nyasia Jenkins, Hannah Mathews, Brittany Henry and Kelly Likos who are making an impact through the walls. The NICAP interns plan to increase the amount of walls each year to further the movement and get Gainesville even more engaged, Milonas said. Visit our Advance Directives page for more information about advance care planning.